Specializing in creating various objects from wrought iron or steel a blacksmith is forging the metal with the help of hand tools to hammer, bend, and cut. 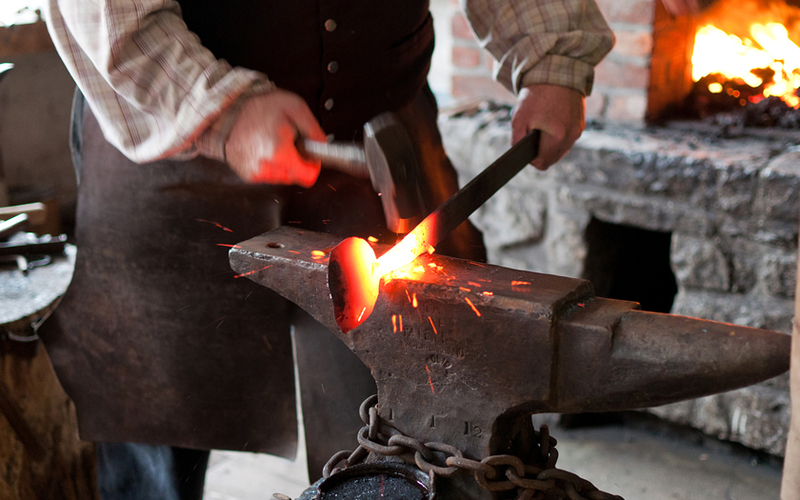 Blacksmiths produce a variety of objects by heating wrought iron or steel until it becomes soft enough to shape with a hammer, anvil and chisel. Blacksmiths make a wide range of things including gates, furniture, agricultural implements, grilles, railings, tools, decorative items, cooking utensils, weapons, and more. Joinery is a woodworking craft that requires joining together pieces of timber to make more complex items. Some wood joints may employ wood parts while others may involve the use of fasteners, bindings, or adhesives. Depending on the characteristics of wooden joints, such as toughness, strength, flexibility, there are different joinery techniques used to meet the necessary requirements. 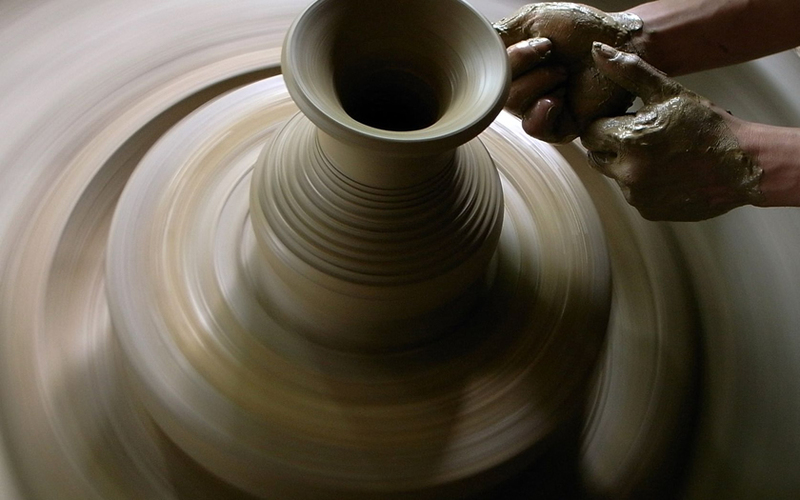 Pottery is a craft of making objects using clay. A potter shapes a clay body into different objects and then heats them to high temperatures to remove the water from the clay. Before a potter begins the shaping process, clay must be prepared. Kneading ensures an even moisture content throughout the clay body. To remove the air within the clay body de-airing is used. It can be accomplished either with the help of a vacuum pug or just manually by wedging. After kneading and de-airing or wedging a clay body, it is shaped by different techniques, then gets dried and fired. 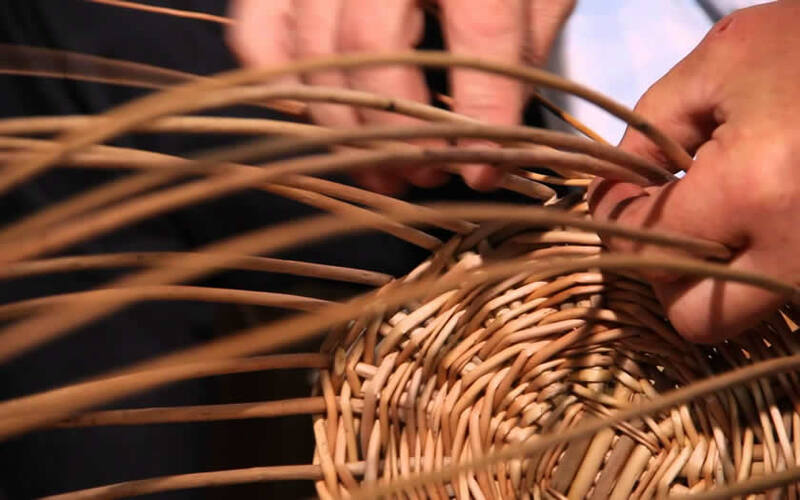 Weaving Vine is the process of weaving vine into two- or threedimensional objects, such as baskets or other containers, furniture, etc. Although many vines differ in shape and size, they can be prepared in a way that makes them easily used for weaving. At first vines should be split and dried. After vines are ready to be used, they are usually soaked or boiled for higher pliability. A page out of our history takes us to the region of Western North Carolina. No need to bring industry to this area as it has it's own unique culture due to it's amazing heritage and craftsmanship. Handmade in America is an organization focused on tourism, professional development, education and outreach. It believes collaborating on partnerships is an essential strategy to strengthen community and enhance economic development. 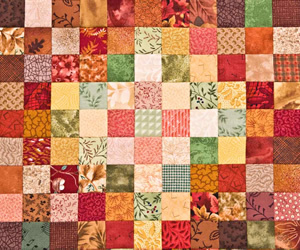 Traditionally craft artists have lived in the mountains of North Carolina as that region has a long history of crafts as an essential part of it's culture. 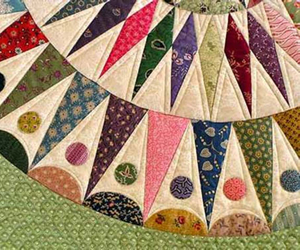 Connecting these artists to the public has been the goal of the Handmade in America organization and they have developed two guidebooks Craft Heritage Trails and Farms and Gardens and Countryside Trails of Western North Carolina. These books feature 600 craft studios and architectural sites along with galleries, inn and restaurants. 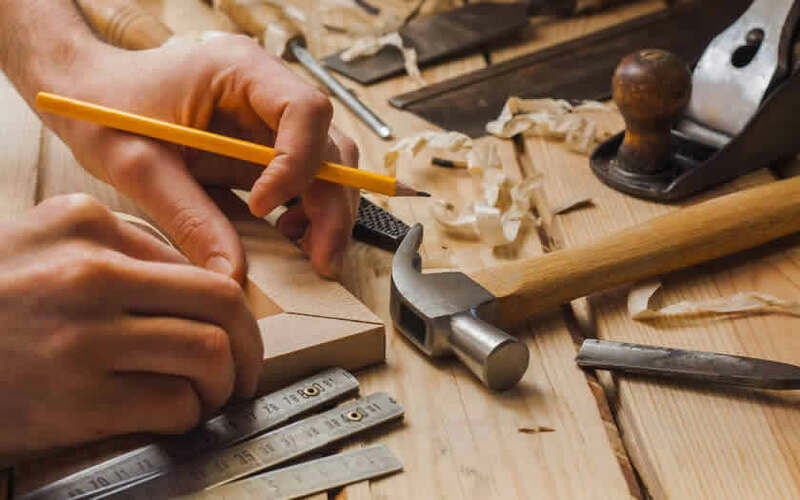 Handmade in America connects architects, builders and homeowners in an attempt to assist craftsmen who need resources. 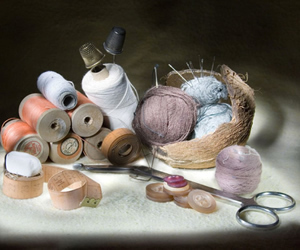 Handmades' craft registry is an online directory that assists artists, galleries and events in Western North Carolina. Handmade supports the craftsman with a number of business training programs that aim to develop successful careers through marketing and professional development. There is practical information about product development, pricing, marketing and accounting. Handmade also supports an outreach program in the educational system of K-12 through exhibits, craft history and hands on workshops. Handmade has partnered with Community Development Programs to rejuvenate and develop businesses. They also partner with the Appalachian Womens Entrepreneurs a womens group which focuses on connecting women with resources and helping them create or strengthen existing businesses. As you can see Handmade in America's contribution to the promotion and well being of historical crafts in our countries region of Western North Carolina has earned this organization much national media coverage. In 2003 Handmade in America ranked one of the top 24 arts non profit organizations in the nation. Truly it represents the best of our country's culture.